MaliVai Washington’s athletic journey began when he was introduced to the game of tennis by his father at the age of five. A native of the Flint, MI area, Washington came from a tennis driven family and at the age of eight he won his first tennis title. As a junior player he practiced seven days a week and often would practice before and after school. In high school as a tennis amateur he won several tournaments including the Ann Arbor Junior Tennis Open, a state Junior Tennis title and the Pro Tech West Hills Tennis Invitational which was a professional tournament. In 1988 MaliVai chose to continue his athletic and academic career at the University of Michigan where he became one of the country’s best tennis players. Washington was a conference champion in doubles and singles while at Michigan. As a freshman he was named the Big Ten Conference Freshman of the Year and was an ITA All-American. In his sophomore season Washington was named Big Ten Athlete of the Year and was once again an ITA All-American. MaliVai finished that season as the No. 1-ranked player in the country and was the ITA National College Player of the Year, accolades that led to his induction into the ITA Men’s Collegiate Hall of Fame in 2007. In 1989 at the age of 20, MaliVai decided to enter the professional tennis ranks and join the Association of Tennis Professionals Tour (ATP). Washington made an impact right away and was named ATP Rookie of the Year. Over the course of his ten-year career MaliVai won four career titles and reached 13 tournament finals. He reached his career high world ranking of No. 11 in singles in 1992, 1993, and 1996. 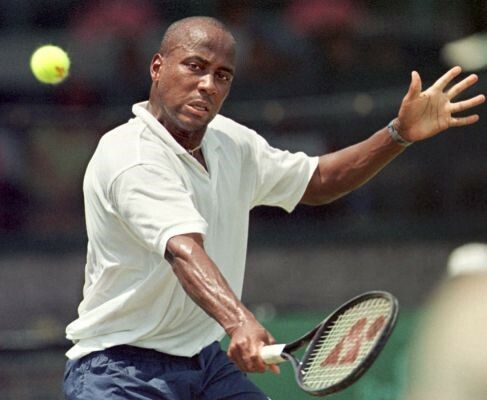 In 1996 MaliVai Washington reached the Wimbledon Championship final, becoming the first African American man to reach a grand slam singles final since Arthur Ashe won Wimbledon in 1975. Washington also represented his country as a member of the 1996 United States Olympic Team and the United States Davis Cup Team. Washington finished his singles career with a career record of 254-184. After retiring from professional tennis due to injury in 1999 he went on to focus on helping others through his foundation. The MaliVai Washington Youth Foundation introduces the sport of tennis to at risk youth and helps them with education and life skills. For his commitment to helping the community MaliVai was awarded with the ATP World Tour Arthur Ashe Humanitarian of the Year Award in 2009. MaliVai Washington you are the true definition of being “Flint Strong”! You have made Flint proud. Welcome to the Greater Flint African American Sports Hall of Fame!